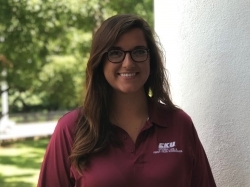 The EKU Colonel's Cupboard is proud to announce the start of our new AmeriCorps TASK VISTA Member, Emily Sledd! During her year of service, she will work closely with Student Life & First-Year Experience staff to: create and plan events focused on food insecurity, grow and promote the new shopping model in the Cupboard, educate the EKU community about the resources offered by the Cupboard, and serve students in need. She expressed that, " Getting to serve students at the campus I love most is a dream for me. I am beyond excited for the next year of growth and capacity building within the Colonel’s Cupboard!" Emily is a 2018 Alumni of EKU, with a B.S. in Psychology and minor in Women and Gender Studies. In the future, Emily is interested in continuing her education and would like to work in higher education. Please feel free to stop by and welcome Emily into her new role in Commonwealth 212 during regular business hours!